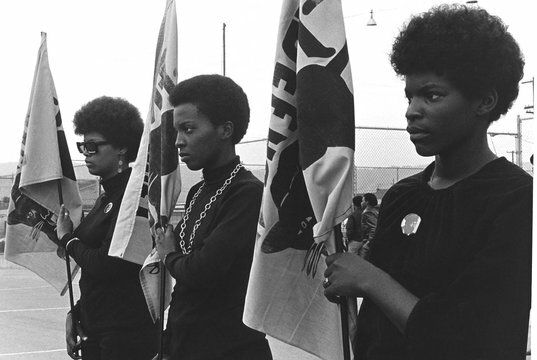 Filmmaker Stanley Nelson’s new documentary The Black Panthers: Vanguard Of The Revolution opened in the San Francisco Bay area on October 2, 21015. The film traces the complex history, influence and legacy of the The Black Panthers in America, and specifically in the African-American community. The Panthers were founded in 1966 in Oakland by Huey Newton and Bobby Seale. Using archival footage and interviews with historians and members of the Panthers the film takes you back to a pivotal period in American history that took place right here in San Francisco Bay area. The party fought for the rights of the African-American people. Police brutality in Oakland was the catalyst for the founding of the party and word about their method of fighting back spread quickly throughout the country. The Panthers went from a local group to a national organization and attracted the attention of local and national media. Many organization members were teenagers, who were drawn to the party and their fight against police brutality, equality and better housing. And the Panther’s rise to fame also attracted the attention of FBI’s Edgar Hoover, who launched a counter intelligence operation and infiltrated The Black Panthers. As a result of the operation the movement eventually petered away, but not before leaving behind a strong stamp on the country and the African-American community. The Black Panthers: Vanguard Of The Revolution is dense and packed with information and helps you understand why this protest movement started and how it gained traction within the African-American community. We find out more about their leaders including the colorful and controversial Elridge Cleaver, the minister for information for the party. We hear from Kathleen Cleaver, Elaine Brown and others. Nelson takes you through the complex and chequered history of The Black Panthers including both the positive and negative aspects of the movement. The film took seven years to make and the timing of the release of the film coincides with a troubling time in our history on race relations and police brutality. Telling a tidy story about the Panthers is not an easy task, but Nelson succeeds in presenting a story that demands your total attention. You do come away with some questions like why was Seale not part of the film? I have an interview coming up with Nelson, where we talk about the film and why Seale was not part of the film.